You are here: Home / Digital marketing / Is online press coverage the best form of SEO? 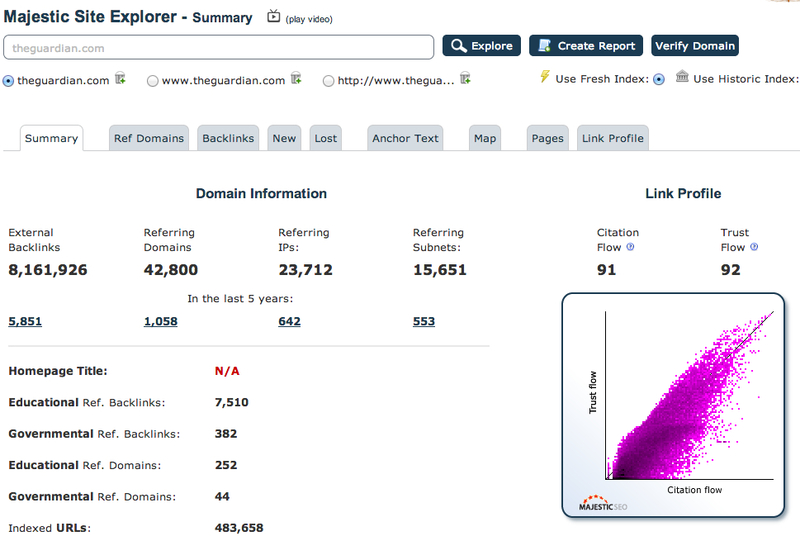 When analysing Google SERP results, you often find that the top ranked pages are press articles. And press articles that have been published very recently. Given all the recent kerfuffle about online press releases and the whole “no follow” links issue, it made me realise that perhaps PR and SEOs are barking up the wrong tree. Isn’t online press coverage one of the most potent forms of SEO available? This is an article published on The Guardian site on June 10th of this year. Why is this page ranking so highly ? Also, the content of the piece is clearly relevant to the search query. But what is the PR (or media relations) value of this article? I confess I have a vested interest in talking about it. The piece refers to a number of people and organisations. I’m pleased to say that I was one of them. In an ideal world, the article would have contained a link back to my website. I could have then used this to measure exactly how many people were motivated by the story to find out more about my consultancy and possibly gain me new business. However, there is a way of indirectly measuring the impact of the article on brand awareness – brand search volume to my own site. Looking at my Google Analytics reports, I could see that brand search volume on the terms “escherman” and “Andrew Bruce Smith” rose 4 fold on June 10th and 11th compared to my average daily volumes for the previous 6 months (and certainly higher than compared to the same period last year). Better still, using attribution analysis, I was able to deduce that a combination of a branded search on June 11th and a subsequent visit via my blog led to paying business via a website generated enquiry. What was the input cost for the online press coverage? I could argue that the cost to me was the 20 mins I spent on the phone to journalist Danny Bradbury who was writing the piece. So what is 20 mins of my time worth? Compared to the value of the work generated, I could argue that my ROI on that piece of press coverage is around 50:1. Of course, there are a number of caveats here. First, although I know that branded search increased in the time period, and I’m fairly certain I can attribute that to the press article, did everyone discover that article via search? Clearly the link was shared on social networks, so the content wasn’t necessarily discovered by search. But given the overall search volume on Google for the term social media analytics, I think can at least attribute a portion of that to search discovery. Also, although I only spent 20 mins on the phone to Danny, I have also built a relationship with him over 20 years or so – if I was being purist, perhaps I should factor in the investment made in that in order to arrive at the I of my ROI equation. But setting all of that aside, I do think the above example has some key points for PRs looking at the interplay of media relations and SEO. What are the implications for PR? One of the key things to take away from this is that although SEO typically focusses on techniques to get your own or your client’s content to rank highly, you shouldn’t discount the fact that relevant press coverage on high authority sites may well stand a far greater chance of ranking highly in SERPS. The investment in time, money and resource to get your client’s own content to rank highly on certain keyword terms may not be justified. However, getting your client written about and linked to on high trust, high authority media sites may well have a far greater chance of ranking well. Not only that, if that press coverage does contain a link back to your own or your client’s site, you have an incontrovertible way of measuring the click throughs, as well as the behaviour of those visitors in relation to a defined goal with an economic value – either sales, leads, content consumption, etc. Even if the coverage doesn’t contain a link, so long as the brand is mentioned, there may be a way to isolate the impact on branded search – and again, to see what contribution this has made to goals with values attached to them. The story you pitch clearly remains paramount. But think about the keyword phrases your client wants to rank well for. Are you building a credible story that will compel the journalist to use these phrases? Also, always be thinking about how you can persuade a journalist to include a link to a relevant client page. Simply asking the journalist to link is probably not the answer (although some may argue that if you don’t ask you don’t get). Helping clients to understand the value of a great story pitch and helping to create the compelling supporting content on their own sites that will make journalists want to link to the client’s content should be a mindset more PRs should adopt. In summary, online press coverage can be your most potent weapon in gaining great SEO results. Given Google’s stated desire to reward content that sits on high trust, high authority sites, getting online press coverage on well respected media sites should give you a triple win – trusted awareness, genuine traffic from real and relevant human beings (either directly or by branded search) – and a means of measuring real economic outcomes rather than the reaching for the easy crutch of OTS and impressions. Great article. I think most people in PR and marketing recognise the value of high quality natural links in the media – the main question, as you allude, is how to get the journalist to include the link. If you can intrinsically tie the link into the story, then that often works (e.g. a link to a report with the full research findings), but this isn’t always possible. The other factor to consider is whether more media sites will move to “nofollow” tags, thereby negating the power of the “Google Juice”. Obviously it still drives direct traffic, but losing the PageRank effect would be a shame. Although arguably, that’s what has led to the whole kerfuffle, as you neatly put it, in the first place. And yes – will be interesting to watch which sites will move to “no follow” – but you’d hope they’d stick to “followed” – if for nothing else to validate the intrinsic value that gaining such a link would bestow on the recipient. I’m sure they do 😉 However, how many PR people would look at it in this way? Or factor into their PR planning the possible SEO benefits of press coverage? Or how many SEOs would have the skills and relationships to pitch a story to a journalist writing for a high trust, high authority site as a PR might? However, how many PR people would look at it in this way? >>> Not many I bet. Do you have examples of where SEOs have successfully pitched a story with a link? I’m sure PRs everywhere would be interested to know how they did it? Eg How did they establish the relationship? The presumption amongst many PR people is that SEOs don’t typically have the skill set to deal with journalists. Possibly – but I can assure you that is how many PRs see it – whether that is a justified view is an entirely different matter. Hence if you have examples of successful SEO journalist pitches it would certainly show them the error of their ways. Andrew, does this count – http://bit.ly/14pP5mx? Funnily enough Rishi actually got a link from that article. As well as this I’ve also helped clients feature on smaller news sites such as STV local and secured backlinks in the process, One client I used to work with even ended up on BBC Newsnight, Sky Sports and a host of other places a result of a blog post I advised them to write(first time they ever blogged) but that was more of a fluke really and extremely lucky timing. Recently I had a story published in The Herald that I pitched, that also made it to print but unfortunately I didn’t get a backlink, it would have been nice but wasn’t really the purpose of the exercise. My main job role doesn’t really involve PR but the process is extremely similar to blogger outreach and SEOs have been doing that for years..